Throughout our workflow we find ourselves repeating regular actions, such as copy and paste or changing browser tabs. We may even use the keyboard for certain actions when we're familiar with the keyboard shortcut. Lite Jot is built from the ground up with simple and intuitive keyboard shortcuts embedded into many of the routine tasks of note-taking. We wanted to take a moment to shine the spotlight on keyboard controls and demonstrate how they can make note-taking much smoother. We've broken this blog post into three pieces: an introduction to keyboard shortcuts in Lite Jot, creating checklists on the fly, and how the tab key can make indenting and breaking lines easier. Depending on where you are focused on in the interface the hint bar will give you a list of shortcuts for that specific area. By "focused," we mean whichever part of the document the page has browser focus. For example, by clicking a textarea on any regular webpage the cursor will begin blinking within it to signify you are focused on that element. As we'll see in further examples, Lite Jot places further emphasis on focused elements by adding a blue accent or background to the element. 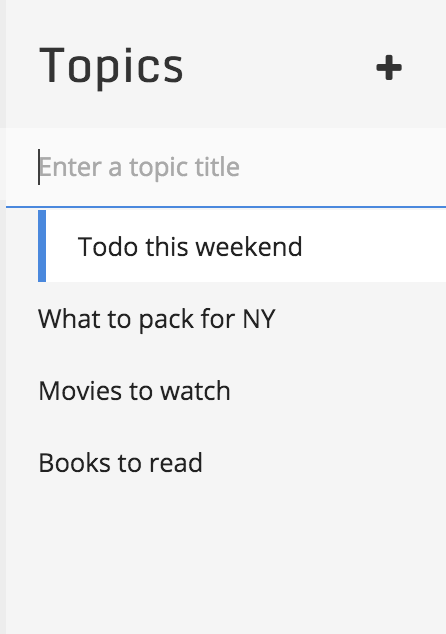 Creating checklists on Lite Jot is already super easy. If you haven't created your own checklist before, no worries! We're going to walk through the process of creating one while using keyboard shortcuts to demonstrate just how fast the process can be. Press the down arrow from the jot textarea to enter the jot tab area. Use the left and right arrow keys to toggle tabs. Press the up arrow to go back to typing. There's many instances where we need to indent and break lines. One example is writing an organized outline. Lite Jot supports the tab key in the standard (plain text) jots textarea. In addition to making indentation possible, we realized that line breaking with shift+return is not very smooth and can lead to accidental saving of a jot (because pressing return will save your jot). We thought about this one long and hard, and decided to combine both indentation and line breaking into the tab key's functionality. We'll walk through how the tab key, while simple, can make your workflow a bit easier. With Lite Jot, you can eliminate much of the mouse-clicking from your note-taking tasks. Sifting through folders and topics is incredibly quick with Lite Jot. No more clicking through items in your notes to find them. You can scroll through your jots (by holding down the up and down arrows), edit jots, topics, and folders quickly, and as you've seen in this tutorial, speedily create checklists with minimal effort. We also saw how the tab key adds convenience to standard jots to make indenting and breaking lines simpler. By incorporating these tips into your workflow, taking notes with Lite Jot can be even faster! Hear about new features, updates, and tips first! Thank you! You'll be of the first to hear of Lite Jot news!